it's a huge Living Room, something like 20x30. it's a partial open design and has one of those huge U shaped couches. there is a massive ET center, like the entire front wall that will hold (hopefully) RB75's, and RC64ii. the sides and rears seem to be an issue with proper placement and that's why the decision to ceiling mount was brought up. 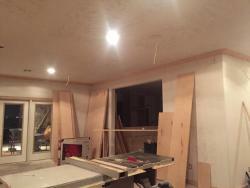 oh, also, the physical design of the ceiling and walls will be a HUGE pain to run the wires through. he told me there are massive joist and top caps he will have to drill through. would CDT-5650-C II be the logical match? i would think a 6.5" speaker would be "fine". the 5800 being an 8" might be too much, but with such a large open living room, it could be beneficial. 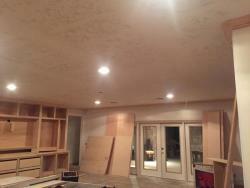 so part of the silly question is, since the LCR is "Reference" is it best to match the ceilings with the same? could using the THX PRO-7502-S-THX work even better? it appears the 5650/5800 can be directional and you can actually point or angle the sound where as the THX, you can't. 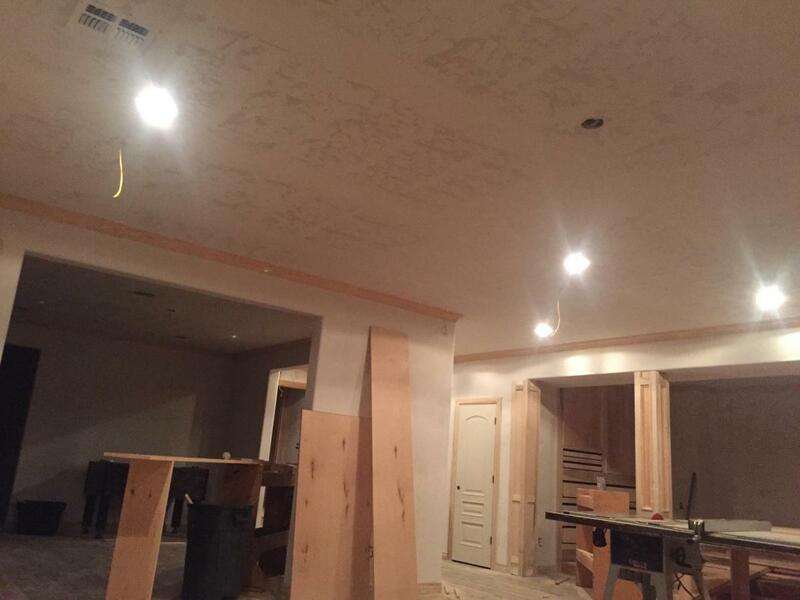 as far as install goes, does the ceiling actually influence the sound? i mean if the rear ones are installed and 1 speaker is in a smaller boxed in area, will it sound different that the other rear one that just happened to be in a much larger area? if that's true, wouldn't it be wise to build an equal or symmetrical boxed in area? would anyone know if there is a sweet spot for that size? i'm assuming the floor joists are 16" on center, so a 16"x24" box? Provide some pictures if you can. Ceiling mount is usually something planned before drywall goes up. If there isn't a second floor above and the rafters are accessible, then running the speaker wire is a snap. If you are running with the upstairs floor joists you "might" get lucky and fish directly, but if there is ductwork, sewer lines, wiring, insulation or dead squirrels, you will be out of luck pulling wire. If you are running against the floor joists above you are out of luck. 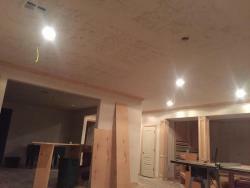 You will have to tear down drywall or surface mount the wire. 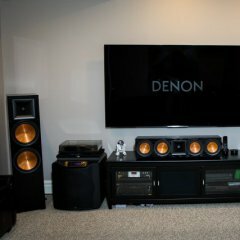 IMO, you should let us see pictures and maybe we can help you figure out some wall mount or even floor speakers for the surrounds/rears. well...u see.....i was asked to help AFTER the room was mostly built! as it is, i had him tear out a huge ET center so he could put the RF7's on the floor and not 3' up in the air! he said he already ran the speaker wire to the surround locations. i have no doubt i will have to re do it. i am playing catch up at this point. i'm just trying to figure out which ceiling surrounds are the best to use or the best to match with reference speakers. i'm also trying to figure out if building a specific size framed hole works best for ceiling speakers. does the braces actually influence the sound. There is a Reference line of ceiling speakers. They are the CDT-5800 and down. The woofer cone can be aimed up to 15 degrees, and the tweeter a good bit more. There are also Reference in wall speakers and they are R-5800 and down. Frankly, walls would be better than ceiling for surrounds or rears, but ceilings would be better than nothing. The tweeter's are pivoting in them as well. There are also Pro versions of ceiling and wall speakers which are a bit more capable, and have neo magnets so they are lighter. Since these all rely on the drywall strength for mounting, that would seem to be a bit better. As you probably already know, floorstanders, surface of wall mounted, or even bookshelves on shelves would be superior to in-wall or in-ceiling speakers. Does your friend intend on having Dolby Atmos capability? If so, ceiling speakers are a good idea for the high speakers. The rest of the speakers need to be monopole like the RF7's etc. There are some nice documents available about positioning speakers for Atmos. Pictures would still be a big help. no, he's not into ATMOS at all. it was something we had to hash out when we were discussing amps. 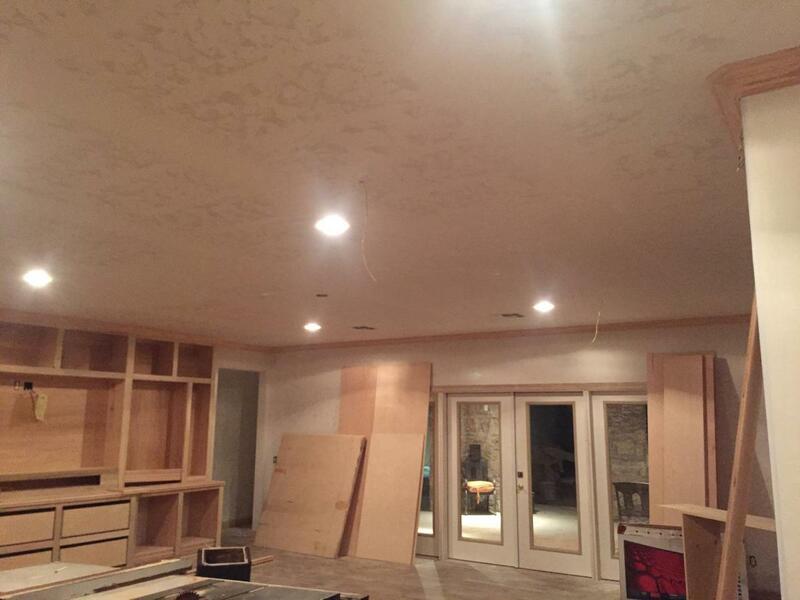 right now the living room will be a 3.1. he's going to put the ceiling speakers in later on. wall speakers would be cool, but in this living room design, they won't work. he said it would also be very difficult to get the wires down the wall. something about headers, top caps, and beams. i was thinking of going with the 6.5" version of the 5800 series. here are the 4 pics he gave me of the Living room ceiling. Builders know building, but most of them don't know diddly about home theater. That entertainment center looks great but where does the center speaker go? What about the left and right main speakers? Dad's house is the same way. 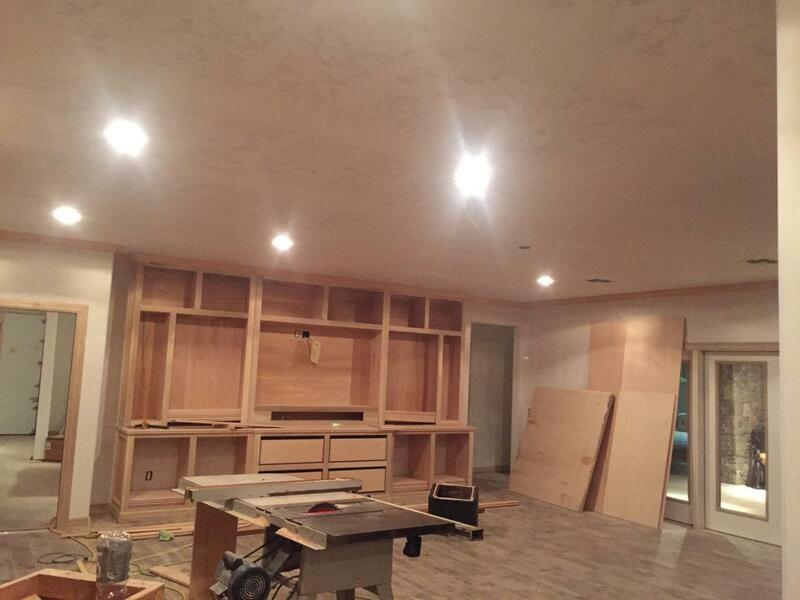 There is this beautiful bespoke built in Entertainment center and no place for speakers. I ended up just sticking a Klipsch sound bar/sub in and calling it a day. Tell your friend to open an account on the forums, and when he is getting ready to build his next place, we can tell him about wiring and speaker locations, etc. I would have loved to have a shot at this while you could see the studs, joists and rafters. oh, you have no idea! when he sent me pics of the HT room ET center, i told him he F****D up! he ripped it all out! yeah, paid, who know's what for it the first time, and now he's building a better HT design (with my overall suggestions). the Living room HT is all the Wife's input. the center goes in that tiny slit below the tv, the speakers (which were supposed to be FLOOR speakers, went in the far right and left tiny areas. this is why i had him change speakers and look for specific book shelf speakers. Paradigm makes some excellent speakers that are thin. These are only 8.5" wide. 3.5" narrower than the flagship Palladium. However, these aren't nearly as efficient, and cannot play as low of frequencies as the P39F. They cost a lot: $4,500 MSRP each. The center for these is 9.5" tall.